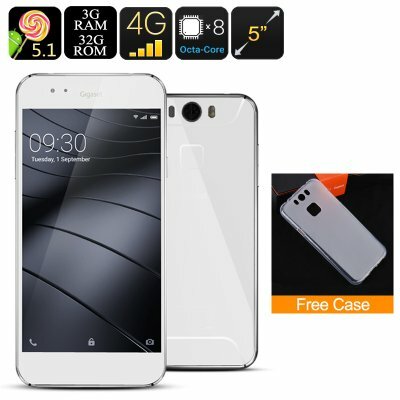 Successfully Added Gigaset Me Smartphone - Snapdragon 810 CPU, 3GB RAM, 4G, Fingerprint Scanner, IR Control, 16MP Camera (White) to your Shopping Cart. incredible front 8MP and rear 16MP cameras let you snap photos and record video at up to 2040x1080. Gigaset is a relatively new player in the Smartphone market and with the Me Smartphone offers surprising specs at an affordable price. A sleek metal and glass Smartphone made of premium materials makes the Gigaset Me a gorgeous looking device that offers a premium feel and build. The Stainless steel frame has a brushed finish while front and rear glass bring great aesthetics and together this offers looks previously only associated with big brand phones. A 5 inch display protected by Gorilla Glass brings full HD resolutions and ensures protection from bumps and knocks. With a Snapdragon 810 processor and 3GB of RAM safely tucked inside the Gigaset Me smartphone brings a powerful performance. The Adreno 430 GPU means it can easily handle games while 32GB of internal memory brings apple of space for all the apps with plenty left for a comprehensive media library. With an IR controller built in you can use the Gigabit Me smartphone to control your TV, Air con, stereo and more so finding the remote will never again be an issue. Where connectivity is concerned you needed worry as this 5 inch smartphone has two SIM slots, each of which supports 4G frequencies. The dual band Wi-Fi is another plus that brings sensational connection speeds for all you needs. On the rear of the phone, you get a square fingerprint scanner, that as well securing the device can be used to take pictures and answer calls. With a 16MP rear camera and 8MP front facing camera this Smartphone lets you snap incredible images and record video in impressive 2048x1080 resolution. The Gigabit Me Android smartphone comes with a 12 months warranty, brought to you by the leader in electronic devices as well as wholesale Android phones..